While adventure games had found success on home PC's in Japan, the market for them on the Famicom was niche. 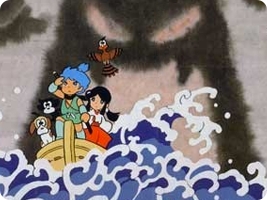 Nintendo's first adventure title, New Onigashima, borrowed its story from several Japanese fairy tales, and told a chapter-driven fairytale. This was followed by another story inspired by the Journey to the West tale.